Retired Justice Anthony Kennedy, right, ceremonially swears-in Supreme Court Justice Brett Kavanaugh, as President Donald Trump looks on, in the East Room of the White House in Washington, Monday, Oct. 8, 2018. 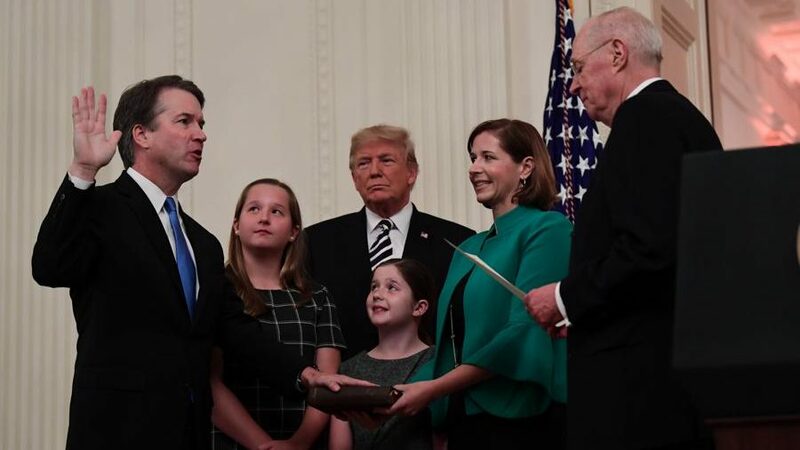 Ashley Kavanaugh holds the Bible and daughters Margaret, left, and Liza, look on. I just hope he doesn’t turn into another Kennedy. I want to be able to say I lived part of my life with a Supreme Court that knew it’s place and it’s role in a Constitutional Republic. I’m sick and tired of “rights” being suddenly found.